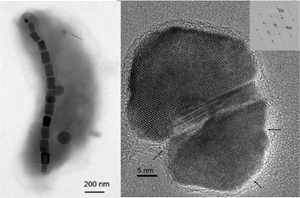 Magnetotactic bacteria provide probably the best studied example of biomineralization: they form intracellular magnetosomes which are nanocrystals of magnetic minerals (magnetite or greigite) surrounded by a biological membrane. The grains of magnetic minerals are typically 35 to 120 nm in diameter, which makes them single-domain (SD) ferrimagnets. We study the minerals produced by magnetotactic bacteria in order to gain insight into the biomineralization process and to determine the special phyiscal and chemical properties of the magnetic nanocrystals. We collaborate with microbiologist colleagues who isolate and culture various strains of bacteria and create genetically modified mutants. These samples allow us to assess the changes in biomineral properties as a result of mutations in the genes that are responsible for controlling the biomineralization process through magnetosome membrane proteins. We use various transmission electron microscopy techniques to study the sizes, morphologies, structures, compositions, and magnetic properties of the particles. Prof. Dirk Schüler, University of Bayreuth (genetically modified mutants of Magnetospirillum gryphiswaldense); Prof. Dennis Bazylinski, University of Nevada at Las Vegas, and Dr. Christopher Lefèvre, CNRS Cadarache, France (various types of isolated and cultured magnetotactic bacteria); Prof. Richard Frankel, California Polytechnic State University, San Luis Obispo (physics of magnetotaxis). Lohße, A., Borg, S., Raschdorf, O., Kolinko I.,Tompa, É., Pósfai, M., Faivre, D., Baumgartner, J. and Schüler, D. (2014) Genetic dissection of the mamAB and mms6 operons reveals a gene set essential for magnetosome biogenesis in Magnetospirillum gryphiswaldense. Journal of Bacteriology, JB.01716, doi: 10.1128/JB.01716-14. Kolinko, I., Lohße, A., Borg, S., Raschdorf, O., Jogler, C., Tu, Q., Pósfai, M., Tompa, É., Plitzko, J.M., Brachmann, A., Wanner, G., Müller, R., Zhang, Y. and Schüler, D. (2014) Biosynthesis of magnetic nanostructures in a foreign organism by transfer of bacterial magnetosome gene clusters. Nature Nanotechnology, 9, 193-197. doi: 10.1038/nnano.2014.13. Pósfai, M., Lefèvre, C.T., Trubitsyn, D., Bazylinski D.A., and Frankel, R.B. (2013) Phylogenetic significance of composition and crystal morphology of magnetosome minerals. Frontiers in Microbiology, 4, 344. doi: 10.3389/fmicb.2013.00344. Magnetic nanoparticles are interesting for science and technology for a number of reasons. Our main interest is in biomineralization (see above), but technological and medical applications are also extremely important. For such applications the nanoparticles need to be characterized as best as is possible, and no other technique can match the versatility of the transmission electron microscope (TEM). The study of the structure and chemistry of nanometer-sized particles poses serious challenges for the electron microscopist. We use some established TEM techniques such as amplitude-contrast and high-resolution imaging and selected-area electron diffraction for the analysis of particle sizes and structures. Compositions are analyzed using energy-dispersive spectrometry and electron energy-loss spectroscopy and imaging in the TEM. However, the magnetosomes are embedded in cells, they are small enough (<10 nm, especially in some genetically modified mutants) to cause significant fringe delocalization in HRTEM images. Obtaining meaningful elemental compositions is also difficult. This type of work thus needs experience with the TEM and patience with carrying out the measurements. In addition, advanced TEM techniques such as off-axis electron holography and Z-contrast electron tomography are also used, in collaboration with the group of Prof. Rafal Dunin-Borkowski. Using electron holography, it is possible to both qualitatively and quantitatively characterize the magnetic properties (such as magnetic induction mapping, measurement of magnetic moments, coercive fields, etc.). Éva Bereczk-Tompa, PhD student; Dr. Ilona Nyirő-Kósa, senior scientist. Taukulis, R., Widdrat, M., Kumari, M., Heinke, D., Rumpler, M., Tompa, É., Uebe, R., Kraupner, A., Cebers, A., Schüler, D., Pósfai, M., Hirt, A.M. and Faivre, D. (2015) Biological vs. synthetic and small vs. large magnetite nanoparticles as MRI contrast agents – a comprehensive physical and theoretical study. Magnetohydrodynamics, 51,721-747. Kumari, M., Hirt, A.M., Uebe, R., Schüler, D., Tompa, É., Pósfai, M., Lorenz, W., Ahrentorp, F., Jonasson, C. and Johansson, C. (2015) Experimental mixtures of superparamagnetic and single-domain magnetite with respect to Day-Dunlop plots. Geochemistry, Geophysics, Geosystems, 16, 1739–1752, doi:10.1002/2015GC005744. Kumari, M., Widdrat, M., Tompa, É., Uebe, R., Schüler, D., Pósfai, M., Faivre, D. And Hirt, A.M. (2014) Distinguishing magnetic particle size of iron oxide nanoparticles with first-order reversal curves. Journal of Applied Physics, 116, 124304. Widdrat, M., Kumari, M., Tompa, É., Pósfai, M., Hirt, A. and Faivre, D. (2014) Keeping nanoparticles fully functional: long term storage and alteration of magnetite. ChemPlusChem, 79, 1225-1233. doi: 10.1002/cplu.201402032. Rečnik, A., Nyirő-Kósa, I., Dódony, I. and Pósfai, M. (2013) Growth defects and epitaxy in Fe3O4 and γ-Fe2O3 nanocrystals. CrystEngComm, 15, 7539-7547. DOI: 10.1039/c3ce40873f. Pósfai, M., Kasama, T. and Dunin-Borkowski, R. (2013) Biominerals at the nanoscale: transmission electron microscopy methods for studying the special properties of biominerals. In Minerals at the Nanoscale. European Mineralogical Union Notes in Mineralogy, Vol. 14, F. Nieto and K. Livi eds., European Mineralogical Union and the Mineralogical Society of Great Britain & Ireland, London, 375-433. Magnetic structures with special shapes, particularly with elongated morphologies, can have interesting applications because of their strong magnetic anisotropy. While the formation of such structures is known in nature (magnetotactic bacteria produce chains of magnetosomes), their laboratory synthesis is difficult and requires high temperatures and/or pressures. 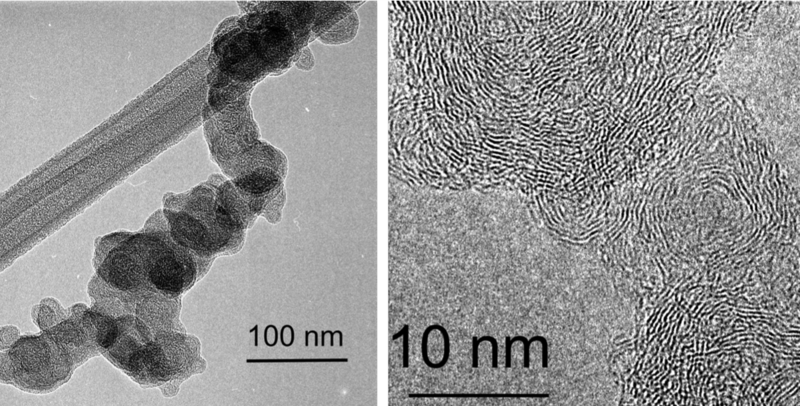 We aim at producing magnetic filaments using biomimetic synthesis, by combining two known bacterial functions: magnetic nanoparticle synthesis and filament formation. Many bacteria have flagella that are used for propelling the cell in an aquatic environment. 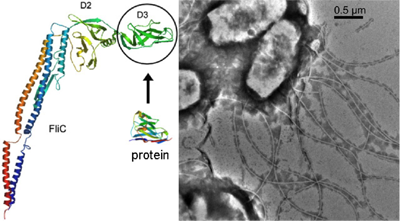 A flagellum is made of the flagellin protein that contains a central, highly variable domain that can be replaced without compromising the protein's stability. We aim at building filaments made of mutagenized flagellin that contains iron-binding sites on its surface. The iron-binding motifs are "imported" from the magnetosome proteins of magnetotactic bacteria. The mutagenized filaments are then used as templates for the precipitation of magnetite from solution. This research is done in collaboration with the bio-nanotechnology research group of Prof. Ferenc Vonderviszt. Éva Bereczk-Tompa, PhD student; Dr. Ferenc Vonderviszt, professor. Bereczk-Tompa, É., Vonderviszt, F., Horváth, B., Szalai, I., Pósfai, M. (2017) Biotemplated synthesis of magnetic filaments. Nanoscale, 9, 15062–15069. doi:10.1039/C7NR04842D. 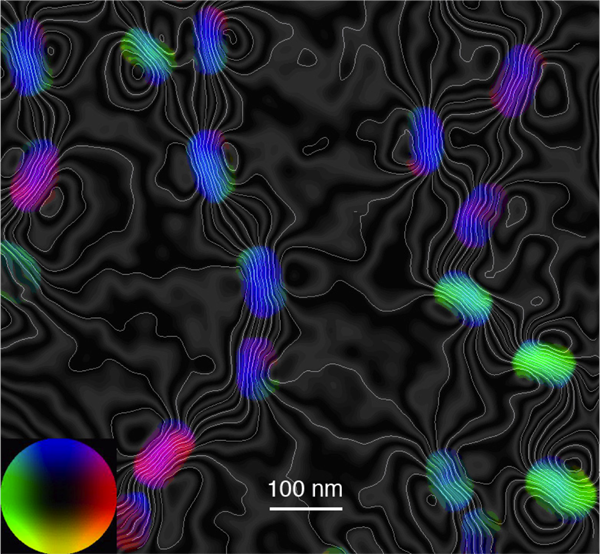 Klein, Á., Kovács, M., Muskotál, A., Jankovics, H., Tóth, B., Pósfai, M., Vonderviszt, F. (2018) Nanobody-displaying flagellar nanotubes. Scientific Reports, 8:3584, doi:10.1038/s41598-018-22085-3. Reichel, V., Kovács, A., Kumari, M., Bereczk-Tompa, É., Schneck, E., Diehle, P., Pósfai, M., Hirt, A.M., Duchamp, M., Dunin-Borkowski, R.E. and Faivre, D. (2017) Single crystalline superstructured stable single domain magnetite nanoparticles. Scientific Reports, 7, 45484, doi:10.1038/srep45484. Bereczk-Tompa, É., Pósfai, M., Tóth, B., Vonderviszt, F. (2016) Magnetite-binding flagellar filaments displaying the MamI loop motif. ChemBioChem, DOI: 10.1002/cbic.201600377. Lake Balaton has great economical and cultural importance in Hungary. It is a large (70 km long) but shallow (on average 3.5 m deep), calcareous lake with a sediment dominated by silt-size carbonate grains. While most of the sediment consists of Mg-calcite that directly precipitated from the water, calcite and dolomite from the erosion of the surrounding Triassic carbonate hills also occurs in the sediment. In addition, "protodolomite" was also identified in the sediment, probably forming diagenetically. Our research focuses on the carbonate mineralogy of the water and sediment. We collect the freshly precipitated material using sediment traps and also filter the suspended matter. Sediment cores were also collected. We wish to determine the relationships between carbonate composition and lakewater chemistry (primarily the Mg/Ca content), and the origins of various carbonate minerals, including Mg-calcite, micrometer-sized dolomite crystals and "protodolomite". 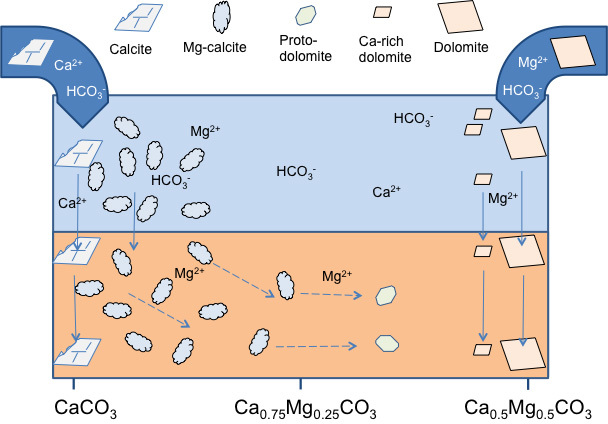 It is also of great interest wether planktonic organisms play any role in the nucleation of the precipitating Mg-calcite grains, and to understand how the filtering organisms (zooplankton and mussels) reprocess the primary carbonate material. Dr. Ágnes Rostási, senior scientist; Dr. Ilona Nyirő-Kósa, senior scientist; Melinda Fodor, PhD student; Zsombor Molnár, MSc student; Kornél Rácz, BSc student. Prof. János Haas (dolomite formation), Eötvös L. University; Boglárka Topa and Dr. Tamás Weiszburg (XRD), Eötvös University. Pósfai M., Rostási Á., Topa B., Molnár Zs., Nyirő-Kósa I., Bereczk-Tompa É., Fodor M., Cora I., Kovács A., Váczi T., Weiszburg T., Haas J. (2017) Karbonátásványok kiválása a Balatonban. (Precipitation of carbonate minerals in Lake Balaton – in Hungarian) 8. Kőzettani és Geokémiai Vándorgyűlés (Szihalom, szeptember 7-9.) Kiadványa, 143-146. Pósfai, M., Nyirő-Kósa, I., Rostási, Á., Bereczk-Tompa, É., Cora, I., Koblar, M., Kovács, A. (2016) Nucleation, morphology, composition and structure of Mg-calcite, the dominant mineral in the mud of Lake Balaton Annual Meeting of the Hungarian Microscopy Society, Siófok, May 19-21. Tompa, É., Nyirő-Kósa, I., Rostási, Á., Cserny, T. and Pósfai, M. (2014) Distribution and composition of Mg-calcite and dolomite in the water and sediments of Lake Balaton. Central European Geology, 57, 113-136. Nyirő-Kósa I., Tompa É., Rostási Á., G.-Tóth L., Nédli B.J., Balogh Cs., Cserny T. és Pósfai M. (2014) A Balaton karbonátásványai. Hidrológiai Közlöny, 94, 22-24. Solid and liquid particles are ubiquitous constituents of Earth's atmosphere. The particles have important roles in atmospheric processes, since they serve as cloud condensation nuclei and scatter and absorb both incoming shortwave and terrestrial infrared radiation. In addition, the particles have strong influence on our environment by reducing visibility and affecting health. In order to understand the effects of atmospheric particles on our climate and environment, their physical and chemical properties need to be known. We use transmission electron microscopy techniques for studying the sizes, morphologies, compositions, structures and hygroscopic properties of individual atmospheric particles. Since the particles occur as distinct entities in the atmosphere, they can be regarded as individual reaction vessels. Therefore, even though the bulk composition of the atmospheric aerosol can be obtained using established analytical methods, we also need to understand the physics and chemistry of individual particles. In the past we have analyzed representative particles from a large number of environmental settings (remote oceanic, urban, rural). Currently, our main interest is in understanding the physical properties and formation mechanisms of particles produced by biomass burning. Dr. Ilona Nyirő-Kósa, senior scientist. Prof. Peter Buseck, Arizona State University, Tempe, AZ; Prof. András Gelencsér, Dr. Ágnes Molnár, Dr. András Hoffer and Ádám Tóth, Air Chemistry Research Group of the Hungarian Academy of Sciences, Veszprém. Hoffer, A., Tóth, Á., Pósfai, M., Chung, C.E., Gelencsér, A. (2017) Brown carbon absorption in the red and near-infrared spectral region. Atmospheric Measurement Techniques, 10, 2353-2359. https://doi.org/10.5194/amt-10-2353-2017. Hoffer, A., Tóth, Á., Nyirő-Kósa, I., Pósfai, M., Gelencsér, A. (2016) Light absorption properties of laboratory-generated tar ball particles. Atmospheric Chemistry and Physics, 16, 239-246, doi: 10.5194/acp-16-239-2016. Németh, Z., Pósfai, M., Nyirő-Kósa, I., Aalto, P., Kulmala, M. and Salma, I. (2015) Images and properties of individual nucleated particles. Atmospheric Environment, 123, 166-170. Buseck, P.R., Adachi, K., Gelencsér, A., Tompa, É. and Pósfai, M. (2014) Ns-soot: a material-based term for strongly light-absorbing carbonaceous particles. Aerosol Science and Technology, 48, 777-788. doi: 10.1080/02786826.2014.919374. Tóth, Á., Hoffer, A., Nyirő-Kósa, I., Pósfai, M. and Gelencsér, A. (2014) Atmospheric tar balls: aged primary droplets from biomass burning? Atmospheric Chemistry and Physics, 14, 6669-6675. doi:10.5194/acp-14-6669-2014. Pósfai, M. and Molnár, Á. (2013) Atmospheric aerosol particles: A mineralogical introduction. In Environmental Mineralogy II. European Mineralogical Union Notes in Mineralogy, Vol. 13, D. Vaughan and R. Wogelius eds., European Mineralogical Union and the Mineralogical Society of Great Britain & Ireland, London, 213-293.